I'm looking to highlight specific words by changing their text colour and background colour. In theory, very easy. But I don't know how to highlight the desired words. 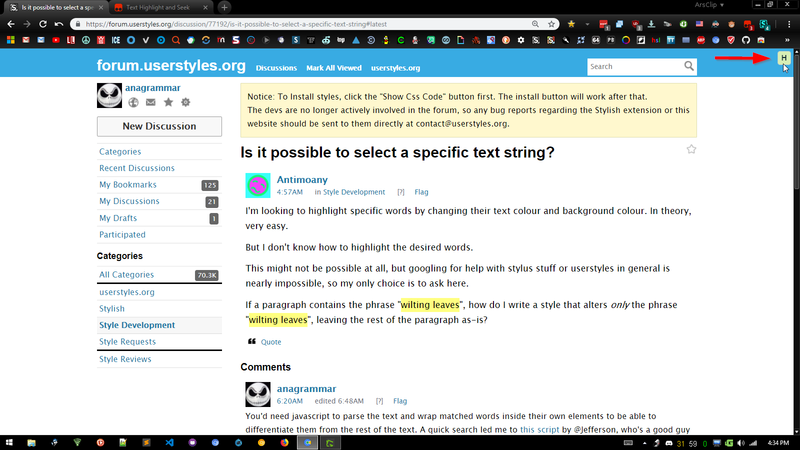 This might not be possible at all, but googling for help with stylus stuff or userstyles in general is nearly impossible, so my only choice is to ask here. If a paragraph contains the phrase "wilting leaves", how do I write a style that alters only the phrase "wilting leaves", leaving the rest of the paragraph as-is? EDIT: Actually, looks like I'm going to need help. I can't sign up to greasyfork to ask the dev for help becase that site will literally not let me make an account. I can't figure out how to get it to actually change. The default highlights are working, but I can't add any new ones. If I close the edit tab, and then choose to edit the userscript again, the edit I made isn't even there. There's no save button. I hit CNTRL+S a few dozen times on the offchance, but that didn't work either. I googled "how to save changes to userscript" and found a page telling me to use CNTRL+S. But that doesn't work. EDIT: Suddenly the saves are sticking. Great. My edit is still there. But it's not working. It's in the script but the string isn't highlighting. we'll set a data-txt attribute using DOM scripting. to the data-txt attribute when the DOMContentLoaded event fires. You never wanna edit the actual script itself if you can avoid it. It's better to use "settings" overrides, so you can receive future updates without overwriting your edits. Use TamperMonkey, and in the script settings, negate all the script "includes" with "user excludes", and then set your own "user includes" to whichever site you want it to work on. I'll use this forum as an example and take some screenshots. 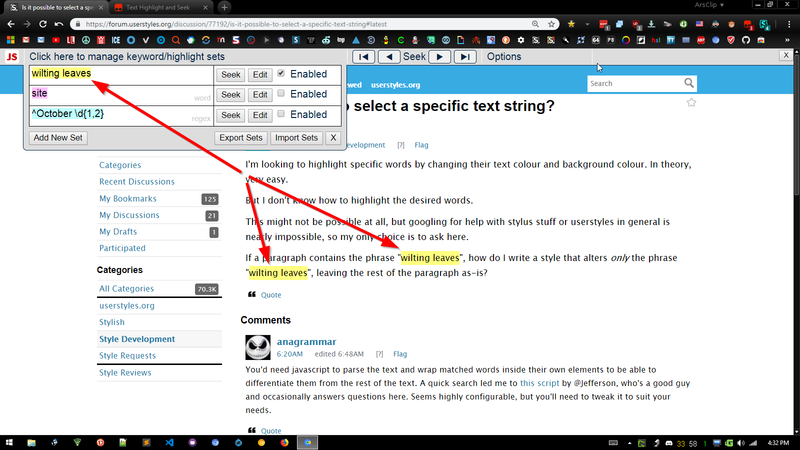 If you click "edit" next to the matching text, you can change which text to match, the styling of matched text, and other options. The script has tons of built-in options, and a "seek" feature for skipping through matches. I've never had the need for this kinda script, but if I did, I like this one. I really appreciate the detailed explanation! 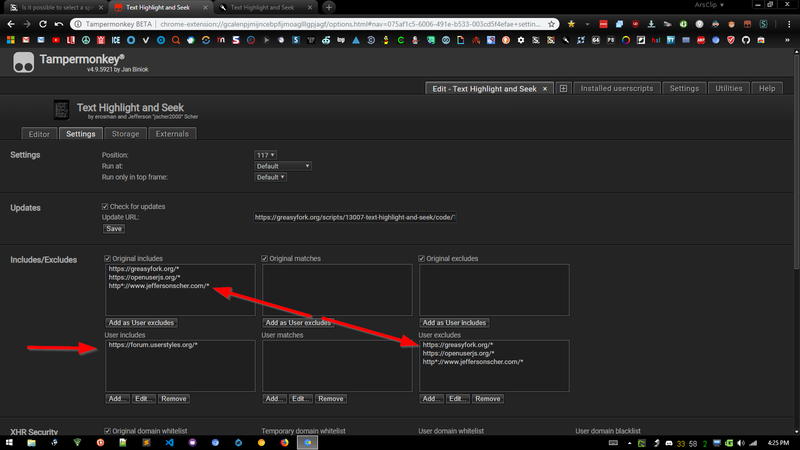 I did try using the "H" menu as the script page said to, but the "H" only appeared on the greasemonkey website, and I thought I had to edit the script manually to force it to apply to other sites. The highlighter is working as desired now. Thank you!